You will earn 2,492 Reward Points. Earn 1 reward point for every 1 dollar spent. 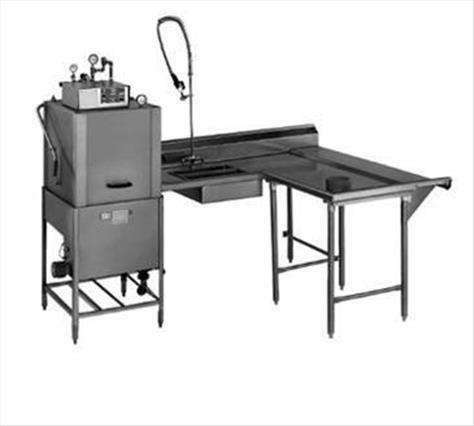 Eagle E102-ADD for each additional linear foot over 36"
The Eagle SDTLR-96-16/3 Soiled Dishtable features an island design with right-to-left operation, and a 60"W x 12"D dish landing shelf with a rolled front edge. It has a 16/304 stainless steel top, an 8" high backsplash, galvanized steel hat channels, raised rolled edges on the front and sides, galvanized steel legs and side bracing, and adjustable feet. It also boasts a 20" x 20" x 5" deep pre-rinse sink with a basket drain, a deck mount faucet hole for pre-rinse, and a scrap block. This unit measures 96"W x 30"D x 43-1/2"H.